This short film was assembled from recently rediscovered footage I shot in 2006, showing the legendary Beat Hotel in Rue Gît-le-Cœur in the Paris Latin Quarter, and the nearby equally legendary bohemian bookshop Shakespeare and Company. In the 1950s the hotel was home to Beat luminaries William Burroughs, Allen Ginsberg and Gregory Corso. Burroughs completed his novel Naked Lunch here, and in conjunction with the artist Brion Gysin, he discovered the consciousness-altering dreamachine and the cut-up literary technique, used in subsequent novels, including Soft Machine and Nova Express. The original Shakespeare and Company was founded by Sylvia Beach in the 1920s, and writers such as Hemingway, Pound, Fitzgerald, Joyce and Beckett gathered there. It featured in the Woody Allen film Midnight in Paris, but it was shut down during the Nazi occupation in 1941. The bookshop, in its current location, was founded by George Whitman, an expat American of literary leanings, who at the time of filming was still alive and active at the age of ninety-two. Back in the ’50s he knew Henry Miller and Anais Nin, as well as Samuel Beckett and, of course, the Beat writers. George Whitman died in 2011, just after his ninety-eight birthday, and the bookshop is now run by his daughter, named after Sylvia Beach. As for the Beat Hotel, in its present incarnation – as the Relais Hotel du Vieux Paris – you can stay for around 150 Euros per night, and if you ask they might give you Burroughs’ old room. 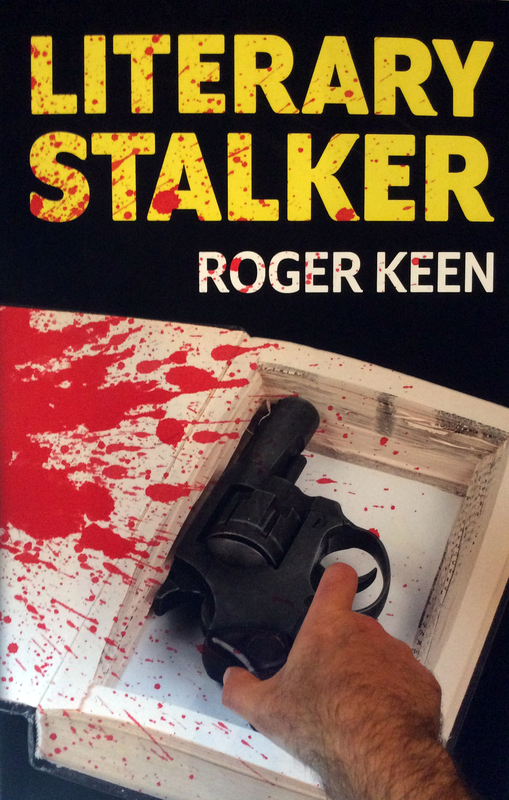 Roger’s new novel Literary Stalker is a psychological crime thriller with horror overtones, but it’s also metafictional – that is, it has self-awareness about its fictionality – and Roger has used the terms ‘metacrime’ and ‘metahorror’ to describe this tendency within the genres the novel occupies. So, we thought we’d ask him explain a little bit more deeply about what he means, and give us some other examples. Darkness Visible: Literary Stalker involves Nick, a writer who is composing a novel about revenge murders. Is it this layering of novels-within-novels that gives rise to the meta dimension you talk about? And how is this different from a novel taking place in the real world, as oppose to a fantasy, for example? Roger: Yes, the layering is part of it, certainly, but only one aspect. And Nick indeed does inhabit the ‘real world’, but that ‘reality’ is constantly being called into question by what he does and thinks. As an ‘unreliable narrator’ Nick is in a league of his own! He’s writing his novel – The Facebook Murders – where the characters are effectively his real enemies (he even keeps the same names for the purposes of a first draft), and he gets his alter ego narrator, Jago, to murder them in stylised ways, as in the movie Theatre of Blood. So his novel is a projection of his wishes, a realisation of the revenge he desires in real life. And as the story progresses, the lines blur, fiction and reality interchange, as Nick is progressively ‘taken over’ by his novel. Which is a very ‘horror’ idea, but because it’s ‘psychological’ rather than ‘supernatural’, it still retains ‘real world’ integrity – at least for most of the time. But throughout there are these ‘nudge-wink’ moments, and towards the end the metafictional undermining and rug-pulling gets stronger, till the twists at the climax which leave you wondering what exactly is ‘real’ and what isn’t.